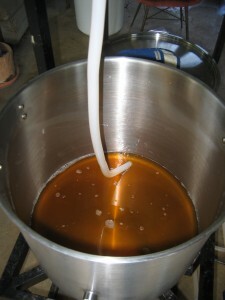 Heating your wort as you collect it saves time on brewday. In the previous article, I discussed when you can safely stop mashing and proceed to the mash out and recirculation steps. Heading to the next step when an iodine test indicates that the mash is converted can frequently save you at least 20 minutes out of the usual 60-minute mash time specified in most homebrew recipes. Today I present another way to save time in your all-grain brew day — pick a lautering method that makes sense given how quickly you can heat your wort.